The nature of LDs is such that every situation is UNIQUE and should be considered that way-uniquely! I DON'T like to give specific advice carte blanche, but am giving GENERAL guidelines only. You, as the teacher and parent, know your child better than anyone else! Don't be afraid to follow your instincts! "Mother's often do know best!" In most cases, I would suggest looking at the AO years one year, or even two years, below the current "grade level" of the LD student. If your student has some significant challenges, then consider looking at the material as much as 3 years below their current "grade level". Although this may seem to be too simplistic a recommendation, in my opinion, it's always better to guess too low a level rather than too high. You may be thinking, "WHY too low?" Well, I'll tell you . . . AO is a cut above most of the curriculum available today. It maintains the high standards of Charlotte Mason most admirably. That's why we all love it! But, when you're dealing with an LDer, you need to be using AO based upon the level your child can master. I believe that's what Miss Mason would recommend. Perhaps a demonstration is in order . . . Let's imagine two scenarios . . . In the first scenario, you pick the "perfect AO year" for your student, but after the first couple of weeks the child struggles, unable to cope with the material . . . and you realize you've made a terrible mistake! The AO year you've chosen is too difficult, or time consuming, for your student. Then you're in the unenviable position of telling your student the work is too challenging for him and he must be "demoted" to the year below. Imagine the crestfallen face and the dejected slump of his shoulders . . . And worst of all . . . imagine the severe blow to your struggling child's confidence. Although not unrecoverable, your first choice is not to cause him to struggle through his schoolwork. He probably is already struggling with his confidence and esteem, and you've just given him a blow that knocks him for a loop! He'll probably end up hating his schoolwork. Your goal was to build him up and encourage him, but that didn't happen in this scenario. In the second scenario, you pick the "perfect AO year" for your student, but after the first couple of weeks the child breezes through his work and begins to be bored . . . The realization hits you that you've underestimated your child . . . but in this case the mistake is not so terrible! You see, now, you can go to your child and give them the exciting news that they are doing so well, you think they need to go up a year in the material! Imagine the grin that spreads over her face as she realizes she has succeeded instead of failing . . . She's being Promoted!! This is an added boast to her confidence and self-esteem. It will give her courage to face the future! She will love to learn! Comparing these two scenarios, parents are certainly going to choose the second one as the desired result, the one in which the child is given great success and confidence by proving how well he can master the material. Although many may say push the child to the next level, I would highly recommend the LDer start at the lowest of the levels being seriously considered, and then be promoted up to a harder level when they prove they can master the work. But, what you probably want to know is: WHAT AO year, HOW do I pick that "perfect AO year" for my student? Since I don't know everyone's child or situation, all I can do is give you some guidelines, as well as some ideas to consider, as you prepare to select the placement of your student. I'd like to encourage you to think through some of the areas below. I hope this process will lead you toward selecting the perfect AO year for your LDer. 1. Your Child's Individual NEEDS And ABILITIES. 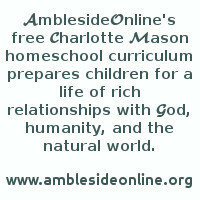 I do think it wise to consider your individual child's needs and abilities in light of the long- term ramifications of the AmblesideOnline (AO) path you are choosing. If you are starting at the AO year 1 with your 6 or 7 year old, you've got many years to teach your child using AO. If, on the other hand, you are starting somewhere in the middle of the AO curriculum, you will have to select a place to start, and figure out how much your child can realistically accomplish in light of his learning issues. PERSONALLY, I think it's a good idea to select an AO year (and term) in which the child reads the majority of their books on their own. After all, a LD child has a NORMAL intelligence and only has a learning difference (weakness) that we have to teach "around". We teach THROUGH their strengths TO their weakness/es. As a guideline to consider, the less severe the LD, the more books the child should be able to read on their own. Look for the AO year, which will not frustrate, but rather gently challenge them! An exception to the child reading the books for themselves might be the first year you transition the student from textbooks to CM's literature-based learning. (You might want to read my article AO Placement for Those Coming from the "Textbook World" if this is something you are hampered with in the transition of your LD child to the CM method of AO.) I could also endorse reading the books to your student if there is a particular LD that makes reading the material very challenging. Understandably, you might choose to read most of the books, for a predetermined length of time, as the child learns some vocabulary and the syntax of a different style of literature...OR reading to the student while you help them remediate a LD. BUT, I would beware of reading SO MANY books that the child becomes totally dependent on YOU to do ALL of their reading to maintain them on a certain AO year. To me, that's like socially promoting a public schooled child in order to keep them on target with their peers! I think CM would tell us to help the child MASTER the material... and not to keep artificially promoting them on to the next level. 2. Mom's Distribution Of TIME For School. Another caution to reading all the child's books, or having a time-intensive AO level, is that if any of the other children in the home are also using AO/HEO, MOM can become overwhelmed with the sheer volume of work she is doing, by reading a large amount of the material to her LD child, or spending great quantities of time with only the LD student. As you already know, your LD child takes a considerable amount of your time and energy to teach regularly and if you add the extra "burden" of reading all their books on an ongoing basis, then MOM may become "over-taxed" with reading for hours each day! I've actually seen moms of LDers, who have 1 LDer, plus one or two other children, starting school at 8:00 each day and not finishing until 4:00 or 5:00 each afternoon! (That didn't even include any chore time!) The mom was reading a large amount of the LD student's material, and then, still had to read a little to each of the other children . . . and it took her all day long. Needless to say, mom was emotionally and physically exhausted at the end of each day! In many instances, one of those "other" children, usually the student needing the "least" amount of help, will become "shortchanged" of the individual tutoring time needed with Mom. Jealousy between siblings is another pitfall of reading too many of a student's books to them, or spending a disproportionate amount of time with your LD student. This may result in behavior issues in the other, non-LD children. As parents of LDers, we have all wondered about the future self- sufficiency of our LD child. We wonder how they will be able to function in "the real world" and HOW we should prepare them for that transition. This is a REAL and VALID concern for us! What should we do? How should we teach them? Are we really qualified? We've ALL had these thoughts . . .
Our goal as homeschool teachers is to educate our children, but parents of LD children, also have to prepare them in ways that other HS parents don't! Of course, the degree to which the self- sufficiency issue figures into our AO placement decision is based upon the needs of the individual child. We can't look at another AOer, or another AO/LD parent and decide OUR child's placement based on their example. This MUST be completely individualized to fit the needs of the child. So . . . How does self- sufficiency influence the selection of AO material for our LD students?? It's easy to imagine that those who have more serious differences might need some specialized preparation. At the risk of getting sidetracked, briefly, I'd advise to write down a list of "problem areas" and meditate on "what and how" to help the child master that area, and then look for logical ways to include them into your school plan. For our purposes on placement, consider what self- sufficiency "extras" must be added to your daily AO work and how much additional work that will involve. Since AO is such a "generous" curriculum, I find it hard to add too many extra activities or therapies into my day. This leaves one with a decision . . . How do I meet the self- sufficiency needs of my child, who has a rather time-consuming learning difference, and balance this against an advanced, as well as, generous curriculum? In my opinion, if there is ever a question of "school" verses the self- sufficiency question, self- sufficiency should be of paramount importance. The child MUST learn basic concepts of Math before Art Study! He must learn certain basic life skills before dealing with an "extra" like Plutarch. Unfortunately, this leaves the LD-parent with the unenviable position of having to choose to drop a book or even a subject! As much as I love all the parts of the AO curriculum, there have been times when we needed to drop a certain subject because we were just too overwhelmed dealing with our LD, or even some "life circumstances". Don't fall into a "guilt trip" over not doing "a complete AO curriculum", but rather choose to view your AO year in terms of the amount of WORK COMPLETED. You can be assured that NO special education classroom would ever give your child the rich literature, and the individualized attention, which you as a homeschool parent, can give your child . . . nor will they love your child as you love your child! So . . . give yourself a pat on the back for a job well done, instead of looking with longing at the subjects you didn't (couldn't) include in your curriculum! 4. Design An Individualized AO Plan For Your LD Student. Since the needs of your LDer may not coincide with those of the average AO student, you may need to consider designing an alternate AO year for your child. This DOESN'T mean you should start from scratch! It DOES mean you should feel free to adjust the AO year, based on the needs of your child! I have scanned through books, and quickly realized my student would NEVER understand the book because it was so abstract, or discovered that the vocabulary was too difficult, and I dropped a book or substituted another one in it's place. Use the AO schedules as your servant, and don't let them become your master! Follow your motherly instincts, and minister to the needs of your child . . . with the help of the AO plan! You might combine 2 AO years, or substitute books, or drop a subject or two, or slow down the AO year completing it in 1 and ½ years - or even 2 years . . . You might even try using an IEP or a *Mastery M.A.P. to help you select the perfect AO year. The options are infinite! The AO e-loop is an awesome place to go for support! However, it's easy to begin to compare our LD child's level, or way of doing AO, with those on the list whose children don't have the same struggle as ours. DON'T compare your child!! Just focus on your child! Be creative in your use of the AO curriculum and don't feel "locked" into "the AO mold". Think of AO in nontraditional ways and use it in the manner that best meets the needs of your child! 5. Consider The PACE Of The Student. Our LD children will often take more time to complete their schoolwork because of their learning challenges. It can make our jobs as home educators frustrating because we want to keep our children, "on schedule". But, our children have their own schedules! They may read late, and once the light bulb goes on, may read voraciously. In one area they may breeze through the material, while, in another they may struggle to complete any of that subject. We MUST focus on the needs and abilities of our children! This should include a schedule that is based on the pace of the LD student - rather than the goals of the parent, or the particular AO year in which our child has been placed. I would MUCH rather see AO parents of LDers take AO slowly, so that the child is doing the majority of the reading on their own, while continuing to remediate the LD areas. Once the LDs are "overcome" somewhat (I know that's something of a misnomer!! They learn to compensate . . . ), then the child is less dependant on mom ... and MOM isn't stressed out with the HOURS of reading required for the upper AO and HEO material. If mom is more focused on REMEDIATION than on PROMOTION, her load becomes lighter as the child takes on more and more of the responsibility for his own education! Take the label off the AO years and ONLY look at the level YOUR child can master! It will be better for YOU . . . and the child!! If you realize you're close to a "breakthrough" in a certain LD area, and you can read the books - try it; but if you realize THEY can read the books but it takes them forever to read them, then consider slowing the pace down or drop a few books! Move at the pace your child can master the material! I really think if you seriously consider the wisdom of the child doing the majority of their work, you will realize that's your ultimate goal of educating a LD child. You will teach them to become self-educating which is the most important hurdle to self- sufficiency. If you teach the child to teach themselves, love learning, and to compensate for their LD, you've given your child the greatest gift a teacher can give their student . . . a love of learning they will never outgrow! The AO year your LD student finishes with really doesn't matter in the long run... they will still be more prepared to "face the world" than if you had rushed them through a series of "hoops", in order to push them through AO/HEO years which they really didn't master! 6. Compare 2 AO Levels. They are many issues that may be specific to your child's learning differences, and I would urge you to carefully consider each of them when you start selecting the AO Placement of your student! Sometimes seeing it all laid out in "black and white" will help you make the decision between two years if you are undecided. You could print out 1 or 2 AO years and in the margin make columns labeling "books to be substituted", "books the student could read alone", "read alouds", etc. so you'll easily see whether a certain year is too hard. You'll also want to list other considerations such as self-sufficiency issues or therapies. Use these lists to help you select the AO year to start your child. After you decide between the two years under consideration, you'll be well on your way to designing your customized AO year! You've already got books labeled as needing to be substituted, too hard, too easy, and those you'll want to read with your child. There are many support groups, which are spin offs from the AO group. You might consider joining the regular AO list, if you haven't done so already. But you will need some specialized help dealing with your LDer. AOwithLDKids is one such list. We want to help the parents of LDers be successful in their educational endeavors. That's why the AOwithLDKids list was created! You are welcome to join our AOwithLDKids support group, and ask your questions of other AOwithLD parents. We will be glad to give you assistance with your specific LD's, how to incorporate the LDs into the CM philosophy, placement issues or substitutions of various materials. Sometimes, it's just nice to "talk" to others undergoing similar struggles, and we invite you to share those conversations as well. A more generalized support group for CM homeschool parents is called CMspecialkids and would be another great place to turn for support. The help on this group is somewhat more general, and is good for those needing support in finding therapies or just chatting about LD related topics from a CM friendly perspective. Also consider joining a group such as AmbleRamble, or one of the other AO "spin off" groups, whose primary focus is substituting books for the AO curriculum. You'll get lots of help if you have several changes you need to make to create your "perfect AO year". I hope the information in this article will be helpful as you begin selecting the AO for your LDer. I hope to "meet" each of you in our AOwithLDKids group!! *The Mastery M.A.P. (Meditation And Planning) is a form Cheri developed to help parents design their own "roadMAP" to adapting CM techniques to meet the specific needs of their LD children. This form is similar of an IEP (Individualized Educational Plan) used in public schools, but with one very important difference . . . it's designed around using CM philosophy, and adapting for challenges using CM Principles and Techniques.